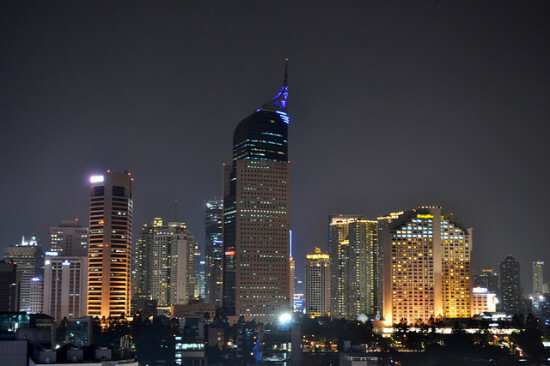 This is an amazing price to Jakarta. From Jakarta, it’s cheap to the rest of Indonesia and Southeast Asia due to the number of low cost carriers based there. Use Skyscanner.net to search for options. Valid for travel on the outbound until May or September – early December or January, 2016 – February, 2016. Must purchase at least 3 days in advance of departure. LAX – HND (Tokyo – Hanedea) – CGK (Jakarta) – HND – LAX. Flights within Asia can be operated by Garuda Indonesia, Asiana, Korean, China Air. Unless you a Delta frequent flyer, you would earn more redeemable miles crediting this to Alaska Airlines if you take a routing that is 100% operated by Delta with Delta flight numbers. You will earn 50% mileage or 5,487 miles when crediting to Alaska with this routing. Mileage accrual will vary depending on routing. 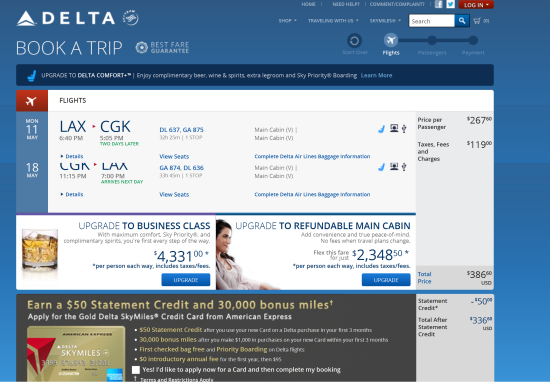 30 Responses to "[FARE GONE] Delta – $386: Los Angeles / San Francisco / San Jose, California / Sacramento – Jakarta, Indonesia. Roundtrip, including all Taxes"
If you don’t mind 2 connections you can get similar fares from Oakland. Found them searching Google flights and on Orbitz. Seemed like a lot of availability. Thanks for the info Matt. Do you have exact dates that are working for you in 2016, especially over New Years? I can’t seem to find one at this price. I’m booking out of SFO, SJC, OAK. Does this mean we have to leave either IN MAY OR SEPTEMBER? how about if we want to do jULY/AUG?? @leo – does not work for July or August departures. its up to end of May or from September – December or January, 2016 – February, 2016. Anyone able to get a 24+ HR stopover in HND to price on ITA or any OTA? I was able to get outbound in HND from 10:35pm to 11:45am and then return 8:50am to 12:15am but wanted to squeeze an extra day in HND. Had no issue booking on Delta FWIW. Thanks! 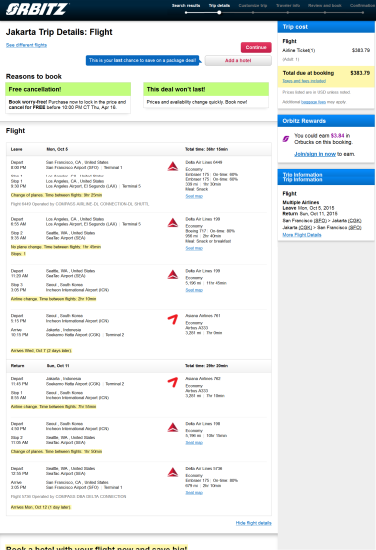 I wasn’t able to do it via Delta’s MultiCity booking tool. I was trying to do the exact same thing! Great deal. Booked for Oct, already have ticket for June. to it. Thanks for the heads up. Is this over?! I am searching from SFO in the month of September and can’t find anything! 2 adults and one lap child. Are you able to get a stopover at HND for more than a day? Can’t find much on Delta.com. Can anyone still get this fare to show? It’s all coming up $700+ for me now. not fing it from sfo… anyone else having any luck? Hi there, is this flight still available? I was searching according to what you told us above…but getting more than $1000 fare…..can you advise? Thank you! These are all gone now. cheapest is $684 on united routing out through tokyo and back through hong kong. that is of course after i just snagged 3 tickets at this price for late Feb from LAX. Can’t find anything from SJC. Cheapest is $697. Anyone found anything? Looks like this deal is dead. Pricing out at ~$700 AI for all dates on DL. The deal is gone! now the cheapest is 701! woot hoot! i’m booked! Is there any way we can sign-up somewhere to get instant deals like this, instead of the newsletter only? Or do we have to check the website frequently? Regardless, love the site. Appreciate the good work you guys do. @Chris – tons of options – RSS, Twitter or Facebook. Hey guys! Thanks again for the amazing work. For the dates I picked (Feb to Mar 2016) a round trip from Jakarta to Singapore is pricing at $160. Is that price within the ballpark of what it should be or will the price drop over time? Thanks! Never mind found price at $90. Good job TFD! Haneda airport no less, it’s way better than Narita.